Imagine looking into a coast forest through an opalescent oyster-white lattice, evocative of venetian blinds. Huge cedars are stirred by a swirling sun, evoking trees swaying in a rhythmic dance reminiscent of the paintings of Emily Carr. The work is stunning. Beachcombers School & Little Oysters Preschool has received an extraordinary art donation by contemporary artist and stained glass master Ted Goodden. The work is two panels totalling 40 square feet and is valued at $18,000. The stained glass is being installed in Beachcombers School’s new preschool, the Little Oysters Preschool. “We have been renovating a large ocean view classroom for our Little Oysters Preschool. 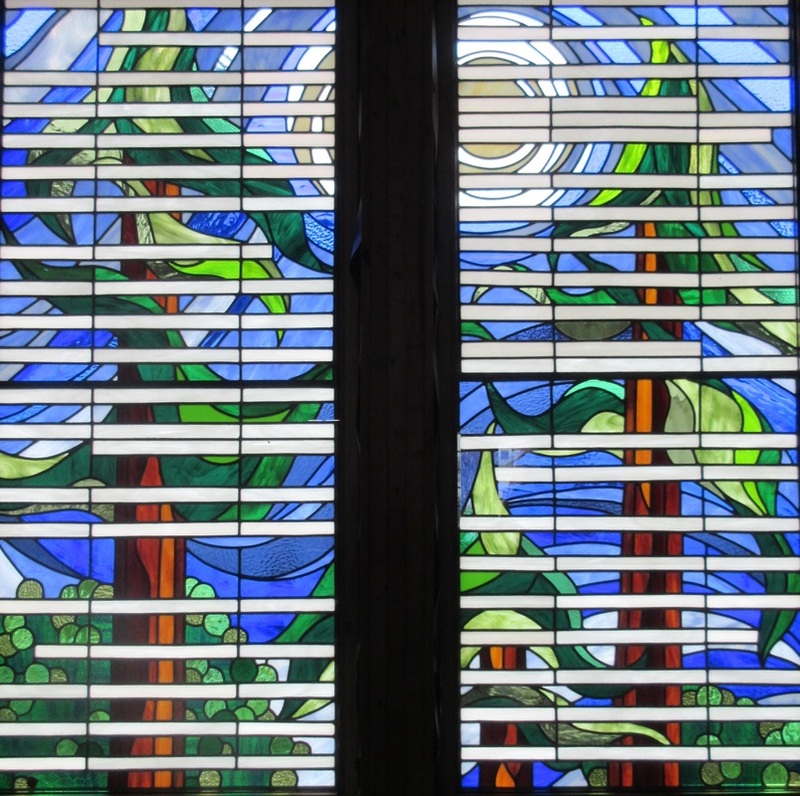 The stained glass is just lovely and is perfect for our nature-inspired program. Our future preschool children will remember the stained glass as one of their first and treasured memories of school,” said Wendy Preston, Beachcombers School Principal. The new preschool facility is planned to open in September. “We are absolutely thrilled with this donation,” said Preston. There is over $3,000 worth of materials and manufacture costs, in addition to expensive installation costs, for which the school is currently fundraising. If you wish to add your name or business to the donation plaque, please contact Beachcombers School. Any donation will be greatly appreciated. “It is a financial stretch for the school, but we believe in the value of public art and the importance of art for children,” said Lambert. Goodden trained under two of the last remaining European stained glass masters. In Canada he apprenticed with Dutch master Theo Lubbers (1931-1990) and in the U.K. under renowned British artist Patrick Reynties (b. 1925). Impressive cathedrals and public buildings in Europe, Canada and the US bear their work. Goodden has worked for the venerable British Victoria & Albert Museum restoring Medieval stained glass; has produced new works for a 16th century building in Wales, completed a $100,000 public art project in London, Ontario, to mention just a few of his works. He has over 75 exhibits and installations in Europe, Australia and North America to his name. Beachcombers School and Little Oysters preschool will be hosting a Grand Opening of the new preschool space in early September. Preschool registration is now taking place for September so you may also book a tour of the school at any time by emailing principal.beachcombers@shaw.ca. Beachcombers School & Little Oysters Preschool have an excellent program that includes nature and coastal studies, visual arts and music. For more information you can see their website at www.BeachcombersSchool.ca. Photo: Stained glass work by Ted Goodden and apprentice Nicole Tritter to be featured in the new Little Oysters Preschool classroom.